“We can’t hear the truth because we’ve been programmed to fear it.” These words from Lauryn Hill are very powerful. It’s hard for people to hear the truth because they are afraid of it. But why are we so afraid of what we constantly crave from people, and out of life itself, so we say? This is something that I’ve come across time and time again. Something I’ve even experienced myself. Truth is we are in fact afraid of the reality of things; we have an issue with seeing things for what they really are. Somewhere in our minds, we have planned the way we want things to turn out or to be. However, everything isn’t always what we think. Sometimes we don’t want to admit when things don’t go the way we may have anticipated, so we run and hide from the truth, leaving us in a state of denial. Not realizing that this makes the situation worse. If we never address the reality of things, they will always stay the way they are. Truth brings about change, and change can be a scary thing. People fear what change brings because they are so comfortable in their situation. Some people would rather not make the necessary moves that come about because of the truth, so they choose to stay in a place of complacency. Just comfortable with being average, not wanting to make the step to something better. And plenty of times it can be fear of the unknown. Many of us of are afraid because we are unaware of how things are going to go. So we stay still and refrain from moving because things just might not turn out “right”. We cause ourselves to miss out on a myriad of things because of fear. 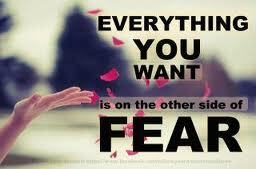 Fear holds us back from many opportunities and accomplishments. When we sit in fear, we don’t work towards anything more. The only way we can have all that we are supposed to have and become all that we are supposed to be is if we take that leap of faith and start moving; something that we can’t do if we fear the truth. We need to start believing the truth about ourselves as well. Often times we doubt our abilities, our gifts, and our talents. When we begin to change our confession and say how great we are, and realize what we contribute, we can begin to soar. When we take the time to address the truth, we can change the reality of it to whatever we want it to be. Things will always stay the same when we don’t confront it. Not all confrontation is negative. Once we realize this, we will find ourselves in a much better place. Try it today and see where it leads you! So proud of you Miss Jones. Great writing. So truthful. Thank you much! Appreciate it! I’m so godly proud of you. Love the article.